Holmlea is a cosy stone built, listed cottage that sleeps 4 in 2 bedrooms. Ground floor accommodation consists of lounge/dining room with a traditional beamed ceiling and an open fire and a kitchen. Upstairs are two bedrooms and a bathroom. The master bedroom has a double bed and the second bedroom has two single beds. Parking is on the quiet street in front of the cottage. Behind the cottage is a pretty garden with a patio which is a real sun trap. The cottage is located in the centre of Lockton overlooking the village green. Lockton is a small, unspoilt, friendly village in the North Yorkshire Moors National Park, just off the Pickering to Whitby road and ideally situated for walking on the moors or by the coast. The popular steam railway runs through neighbouring Levisham - and on a still day you can hear the whistle blow. Holmlea Cottage is owned by a family company. We all use the cottage as often as we can and love the area. The family spans four generations; Great grandmother, the older generation, their grown up children and now a baby. Though he hasn't been to the cottage yet. We bought it because it is not too far from where we live, mostly Yorkshire, and so we had often visited the area and wanted to be able to stay for longer. We all fell for the cottage on the first visit which is surprising with such a large family. The area is great with so many contrasts; sea, moor, forest, villages and for those who do not live so close, the city of York. We didn't want a large garden to look after so the secure sun trap behind the cottage is ideal and the village is picturesque but not just for tourists. We love the olde worlde feel of the place and the open fire reminds us of a past age. Whitby has become a must go destination in the years since we bought the cottage and we particularly like Runswick Bay and Staithes. Bathroom with bath, WC and sink. Lounge/dining room with sofa and two armchairs, dining table and chairs, TV with DVD, CD/radio, telephone to receive incoming calls. Electric cooker, microwave oven, fridge, toaster and kettle. Sorry, the age of the property means there are stairs inside and out. Notes on accommodation: Open fire, storage heaters and electrically heated water all fuel provided. Well behaved pets welcome. Outside: Patio area with table and chairs. Garden has fence or walls on all sides so is secure for bike storage or pets but access is through the house. Cleaning / Towels / Linen / Maid service: Cleaning at the start of the let, linen and towels provided at the start of the let. The cottage is small and quaint, I would have preferred to have a shower in the bathroom but you can't have everything. The grand kids loved it. Great base to explore the area. 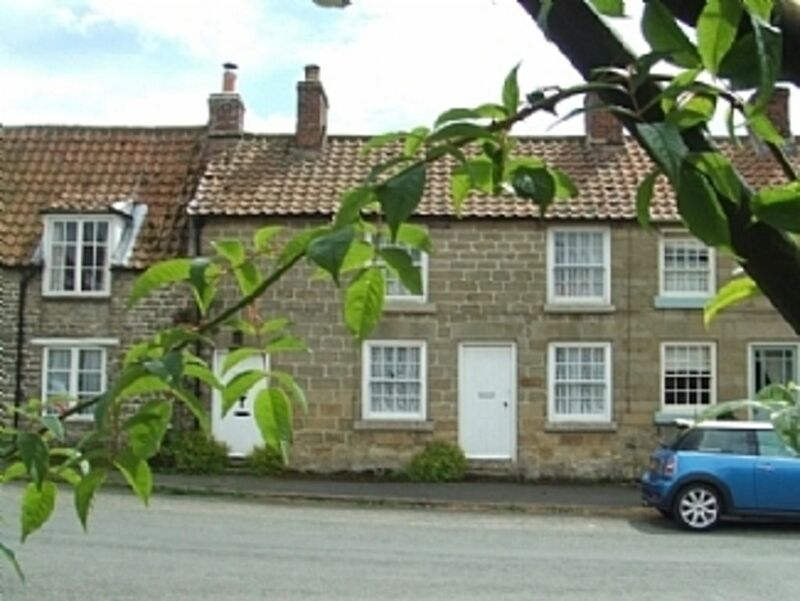 A lovely little cottage in an ideal location for exploring the Yorkshire Moors and coast. We had an enjoyable stay in Holmlea Cottage , Lockton . The weather was superb so we were able to sit out in the pretty cottage garden when we returned from our explorations. The cottage was cosy and well equipped for self catering. The lack of a shower was a downside but there was plenty of hot water for baths! The local town of Pickering was ideal for shopping and everyone was very friendly. Very clean and tidy, beautiful location, fantastic value for money. My only complaint is that the windows throughout the property were sealed shut, as an asthmatic, I like to have lots of fresh air, especially when it is warm, so that was a little frustrating, other than that it's a fantastic little cottage. Thank you for your review, I am sorry that you had a problem with the windows. The windows are not "sealed shut", every window has one moving sash. They must have got sticky from lack of use, I will see to this as soon as possible. A lovely little cottage. We've enjoyed staying there for a week. I would have loved to sit more often in the garden, but there was too much rain. Wonderful walks around Lockton & the tearoom in the village has the best lemon drizzle cake we've ever had! Thank you for your review, please come again and you may get better weather. Thank you for a lovely stay. The cottage has a friendly comfortable feel. The views on the road to Whitby are sublime. Be careful if you decide to take a peep at the next village Levisham as we did as a last minute idea on our way back one evening. We found ourselves driving along the steepest hill imaginable with twists and turns and frightening drops. Apparently there is another road somewhere but we didn't find it. We enjoyed a fabulous weekend and would like to stay again in the future. Highly recommended! Thank you. We would be delighted if you could come and stay again. The road to Levisham is very steep and twisty but the only other road is a Forestry Road through the station which is normally closed to cars except for access. Whitby is located 17 miles away - and usually takes around 20 minutes by car. It has a quaint old harbour with a working fish dock a long sandy beach and historic connections to Captain Cooke and Dracula. Scarborough and other coastal towns and villages are also easily accessible. Car use is essential in this location but the roads are good and usually quiet. Many walking routes are accessible from the village, and Hole of Horcum 2 miles away. Two pubs, serving food, within 1 mile. The town of Pickering is a ten minute drive and has lots of eating places, a supermarket and other shops including a good second hand bookshop. The drive to Whitby and the coast is easy and it is well worth the visit as are Runswick Bay and Staithes. The Dalby forest visitor centre is about a five minute drive and here there are walks, cycle trails and an adventure trail. 2 local pubs, each about 1 mile away, the Horseshoe at Levisham and the Fox and Rabbit on the main road both serve good food. Supermarket, banks etc at Pickering. Booking Notes: Ring or e-mail for details. 10% deposit required on booking. Balance paid 5 weeks before letting. Changeover Day: Changeover day flexible - please contact us to discuss your requirements. Arrival; after 3pm Departure; by 11 am Notes on prices: Prices are in UK pounds.